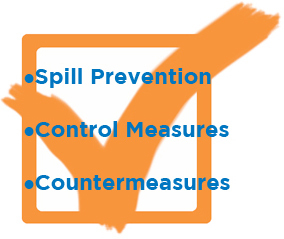 It is important to have a Spill Prevention, Control, and Countermeasures (SPCC) program ready if disaster strikes. In many instances, you are required by Federal law to comply with SPCC regulations. other oils and greases, including synthetic and mineral oils. While some facilities are very familiar with the SPCC rule, others may think it does not apply to them because they are a small facility, or they only use oil occasionally. If you farm, store animal or vegetable oils, or are part of a municipality, you might not be exempt from the regulation. If you answer YES to the following questions, the SPCC rule applies to you. √ Do you use oils or fuels? √ Do you store oils in containers 55 gallons and greater? √ Do your containers (greater than 55 gallons) total 1,320 gallons or above? My facility is regulated. What is the next step? You must create an SPCC Plan that describes the efforts and procedures your facility will implement. Download our free ebook, “A Guide to SPCC Planning”, for assistance in developing your plan.